The Manhattan Beach community stayed dry on Sunday, gathering downtown for the Taste of Manhattan Beach, which featured local cuisine, beer and wine tastings, a farmers market and chef demonstrations. 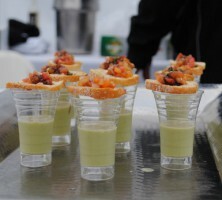 Festival-goers munched on gourmet sliders and maple bacon ice cream. “This event is the perfect place to satisfy your craving, since everybody’s favorite places are all set up in a row,” said Manhattan Beach resident Tara Kennedy. “It’s fun seeing my friends all gathered here enjoying themselves as well, being here makes us have that ‘cozy at home’ feeling”. Feed the Kitty played live music while celebrity chef demonstrations were held by Brian Malarkey and Devin Alexander, New York Times bestselling author. Alexander demonstrated her healthy easy-to-make-at-home version of the Big Mac. “It tastes like the clone to the burger, but without the guilt of eating a thousand calories at a fast food restaurant,” she said. Later, her burger was distributed to the audience as she explained her tricks to cooking with a healthy diet in mind. Art by the winners from the Centennial K-12 Art Contest was on display among historic photos dating back to the early 1930s. The most popular photo proved to be an aerial shot of the Manhattan Beach pier with a 200-foot wooden extension, a part of the pier that was added in 1928 and later destroyed by a storm in 1940. Longtime residents gathered around the history section remembering the houses in which their families had lived in the past. The Manhattan Beach Centennial Parade and Historic Picnic will be held on May 19, 2012. For information on participating in the parade, contact Jan Dennis at 310-372-8520.